I started following Robh Ruppel's art ever since I learned that he was behind the art direction of Uncharted 2. Back then, I was mesmerised by the staging and composition of the game's environment art from The Art of Uncharted 2: Among Thieves artbook. Robh Ruppel has a way of framing scenes such that they always look so inviting. So it's great to see this new book from him. Many of the artworks in Graphic L.A. have appeared previously on his blog The Broadview Blog. There are additional art as well as many sketches included. The drawn subjects are mostly urban scenes from Los Angeles, hence the title of the book. 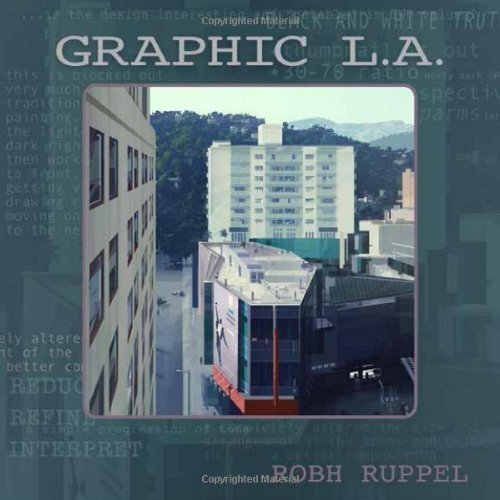 In Graphic L.A., Robh Ruppel adopts a more graphical approach to creating his illustrations. The emphasis is on breaking down scenes into geometric shapes and symbols, focus on getting the correct tonal values, and then working with that in mind to create a graphic representation of a scene. It's sort of similar to how some watercolour artists think about shapes for their paintings. The artworks are stylised and beautiful. There's even a vector quality to his artworks that is characterised by sharp edges. The colour scheme is very tastefully done. The paintings remind me of photographs that are treated with some colour filters, or those from old school film cameras. This more vector-like style with strong symbolism is a departure from his other painterly style, which you can see in his earlier artbook Aspect Ratio and older works from his blog's archive. There are quite a few sketches included and they are experimentation and exploration of values, shapes and silhouette. They remind me of another book Framed Ink which also touts the importance of having good value design. Where the book falls short would be in the area of instructions and insight. The use of white space is usually plastered by tips in large typefaces. There are good tips as well as vague tips that could do with more elaboration. Some of the insightful information that I read on his blog are not in the book. I wished there could be more shared on techniques, and especially on how he thinks about colour schemes. It's a beautiful artbook. I enjoy looking at how other artists use composition to frame their drawings, in this case Robh Ruppel is a master at doing so.